High-tech imaging techniques have revealed an edit made in the rough draft of the Declaration of Independence. Thomas Jefferson likely made the edit as he wrote, smudging the original word "subjects" out with his finger and writing "citizens" over it. Wadena county, MinnesotaCourtesy wikipedia imageDuring the summer of 2009, I had the opportunity to spend four weeks in the field doing actual scientific investigation. From mid-June until mid-July, I was a participant in the University of Minnesota's archeology summer field school run by Professor Kat Hayes. The mission of the field school was to attempt to confirm the presence of a European footprint in this remote part of what would become a young Minnesota territory. 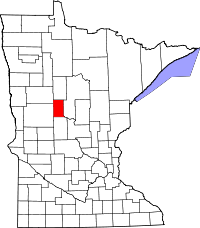 The site of Little Round Hill is located in Wadena County, Minnesota, part way between the towns of Staples and Wadena. Currently, it is part of a county park system. Located at the confluence of the Crow Wing River and the Partridge River, Little Round Hill is believed to be a historical site from the early French fur trading days. The story goes something like this. In the mid- 1800's, William Warren wrote an account of Ojibwe life in a growing Minnesota territory. In his work, Warren interviewed an elderly Ojibwe man. This elderly man recounted days spent at a fur trading encampment while he was just a young boy. The encampment centered around the dwelling of a French fur trader and his handful or so of Coureur-des-bois . Staying with this trader were around ten Ojibwe hunters and their families. According to the account, Little Round Hill became the focus of contention between rival bands of Ojibwe and Lakota hunters. By oral recollection, there was an incident of more than 200 Lakota warriors approaching and attacking the outpost. The Frenchmen and Ojibwe held the attackers at bay with guns while barricading themselves into the main encampment. The attackers, with only a few guns and armed mainly with bow and arrow for projectiles, were unable to overcome the defenses and eventually retreated. The site itself had been recognized for its historical implications for quite some time. For years, local residents have pondered that possible remains may lie buried at the Little Round Hill location. In 1992, Douglas Birk conducted an initial survey of the site. While artifact remains spanning several centuries were recovered in his explorations, they didn’t produce evidence of any of the structures described in the oral account. The summer of 2009 excavations started out with a whimper. Rain and uncooperative weather hampered our beginning efforts. As the clouds passed, the field crew opened a handful of excavation pits and began searching for artifacts. The results were productive and encouraging. Items of distinct European influence started to appear in most of the test areas including musket balls, cut pieces of finished copper, small trade beads, a couple pieces of worked metal (still of undetermined nature), a few pottery shards and even a small ring (possibly silver). Additional materials such as a stone arrowhead, lithic debris, and animal bones both broken and charred were recovered. After a month of work and close to a dozen open explorations, much more habitation evidence was revealed. While no sign was uncovered of the fortifications mentioned in the oral account, at least three of the excavation points did expose strong support for likely hearth locations. These may have been centered near the possible dwellings of the occupants. Alas, the season of excavation is a short one in Minnesota. After a month of work, the crew retreated home with bags of evidence in hand. During the 2009-2010 academic year, the materials are being analyzed and cataloged at the University of Minnesota. A full report on the findings is expected this coming spring. While the preliminary data does not show conclusive evidence of the mentioned encampment, enough material was recovered to warrant further investigation. Plans are to return to the site next summer to resume excavations and expand exploration of the area. I, for one, can not wait and hope to have my hand in the dirt once again come summer 2010. Galileo telescope replicaCourtesy Michael Dunn Pope Benedict XVI chose today's winter solstice to remark that the 400th anniversary of Galileo's use of a telescope is soon upon us. Galileo was condemned by the Catholic Church for supporting Nicholas Copernicus' discovery that the Earth revolved around the sun. In 1992, Pope John Paul II apologized, saying that the denunciation was a tragic error. 2009 has been designated International Year of Astronomy (IYA2009) by the International Astronomical Union (IAU) and the United Nations Educational, Scientific and Cultural Organization (UNESCO). I recommend checking out the International Year of Astronomy website for news and events. The vision of IYA2009 is to help people rediscover their place in the Universe through the sky, and thereby engage a personal sense of wonder and discovery. Eleven cornerstone projects will help to achieve IYA2009's main goals (click link for details). 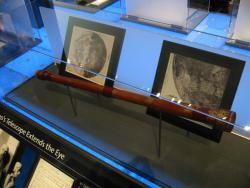 100 hours of astronomy will enable people to look through telescopes. I just got sucked into this wonderful list of commonly held scientific beliefs which are in fact not true. Some of my favs: when a meteor lands on earth it is generally cold not hot, Koalas are not bears, and blood is never blue, veins appear blue because of the same reason the sky does, Rayleigh scattering. It's not exactly topical or current but I just couldn't resist posting these. I'm a sucker for random facts. First off, check out some of the pics of Tomás and Alberto's project, the Museo Aero Solar. There was lots of talk at the presentation about women's important role in the early days of flight when ballooning dominated. There was even some debate about whether a woman was the first person in space...via balloon...in the 1920s! I couldn't immediately find any information on this claim on ye old internets, but I would love to hear from any buzz readers who might know more information. Getting to space by balloon might seem crazy, but that's exactly what the Air Force was trying to do before our attempts with rockets. Check out Project Manhigh(yep its really called that) and Project Excelsior. Several of these early space balloons were piloted by Air Force Colonel Joseph Kittinger, the first, possibly only, man to ever break the speed of sound, without a vehicle. 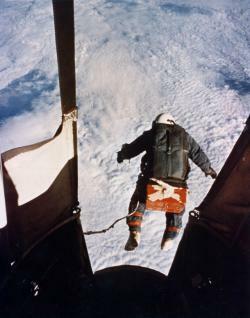 He did it by jumping out of a balloon about 20 miles up. Students are getting into the high altitude balloon game all over the place as well: reusable experiment platform goes to the edge of space, pics at the edge of space, and legos in space. I think balloons are my new favorite science obsession. Scientific Frontline has a video celebrating 50 years of exploration by NASA which was created Oct. 1, 1958. Researchers have used a solar eclipse to determine that Odysseus returned home from the Trojan Wars on April 16, 1178 B.C. Not bad for a character widely thought to be fictional. Today's the 38th national celebration of Earth Day. Step outside, Buzzers, and appreciate this blue planet of ours, and then make a pledge to yourself to do more reducing, reusing, and recycling. If you are interested in learning more about cholera go to Science Museum of Minnesota's Disease Detectives website and explore cholera and four other important diseases through time. Cholera is also highlighted in a New-York Historical Society exhibition called PLAGUE in GOTHAM! Cholera in Nineteenth-Century New York. Click here to read an article about the exhibition in the New York Times.